The Tema Metropolitan Assembly (TMA) supported by national Government has entered into a long-term Structured Partnership with a U.S. led investor group. The proposed agreement enables Atlanta, Georgia and local based Transatlantic BDR, LLC (TBDR) to develop along Tema's coastline, a multi- billion-dollar complex. The project which is part of an overall regional economic development plan is designed to grow international tourism. Plans include a 60,000 seat (FIFA certified) soccer stadium along with commercial retail and residential mixed-use accommodations targeting cross-border corporations and regional companies. "I wish to express our support for this landmark development that will forever change Ghana and be a showcase for the future development on the continent of Africa," stated the Minister of State, the Honorable (Dr.) Rashid Pelpuo. Tema Metropolitan Chief Executive, Honorable Isaac Ashai Odamtten adds, "We stand by a much more imposing duty to provide the needed interface for our Port and Industrial City and promote a livable, smart city that offers an opportunity to live, work, and leisure in the City in the Center of the World. Indeed, a life changing and national transforming project is conceived." The project will upgrade ailing infrastructure, creating highly skilled job opportunities for Ghana's educated workforce. Energy distribution is key and leveraging the latest in technologies via strategic partnerships with emerging technology companies in phasing out of legacy systems is essential. 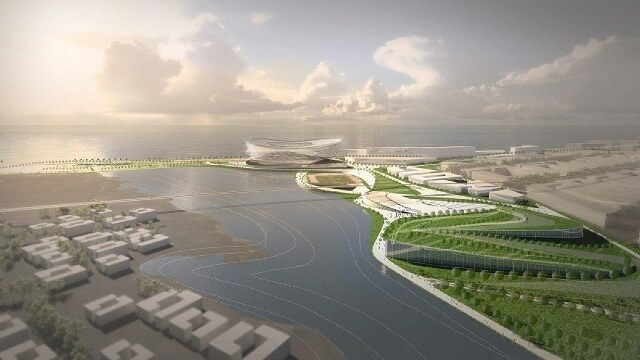 The massive undertaking of building a convention center, hotels, and a FIFA compliant soccer stadium will enable Ghana to host major international events therefore elevating the country to a first-tier market. Infrastructure investments will include new roadways; a light rail system expansion; renewable energy; and a 6G wireless communication network. "This privately funded partnership with the Ghana government marks an aggressive outlook taken by the part of officials to establish the country as an international destination; not just for leisure but for global qualified investors and entrepreneurs to participate in the regions' fast-paced economic growth. TBDR is cultivating a diverse partner and investor base for optimal success," stated Uduak Udofia, TBDR's CEO.